Chef's Knife Corian Black - Spyderco, Inc. Page 1116 – Spyderco, Inc. The K12P is a proud addition to Spyderco’s burgeoning line of kitchen knives. 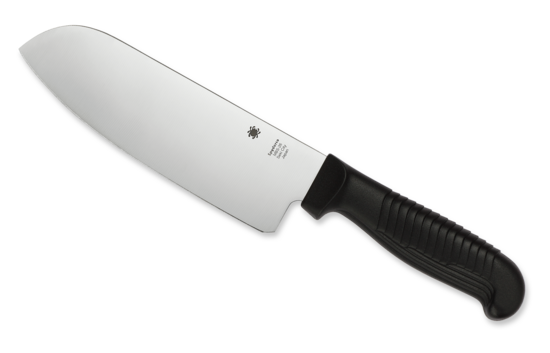 A handsome, full-sized chef’s knife, it combines elegant styling and meticulous craftsmanship with world-class cutting performance. Its gracefully curved blade is full-flat ground from premium VG-10 stainless steel to provide a superior blend of edge geometry, edge retention, and corrosion resistance. The blade profile provides plenty of clearance for the user’s knuckles and supports all cutting and slicing techniques with ease. Its full tang is couched between beautifully contoured solid Corian® scales that are permanently secured with three stainless steel cutler’s bolts. The result is a hand-filling grip that offers outstanding balance, control, and comfort, even during long periods of use.